Jolie Hobbs has been writing since 2000 and has gained recognition from the University of Portland for a 2006 essay she wrote on the ethics of human cloning. She owns Moxie Personal Training and is pursuing a Bachelor of Science in exercise physiology at Portland State University. Carnitas are a Mexican dish consisting of small pieces of pork that are cooked in their own fat, salt, and sometimes oranges. They're typically considered a special occasion food, served often at celebrations within the Mexican culture and at most Mexican restaurants. According to the website My Fitness Pal, carnitas contain approximately 102 calories per 2 oz. One serving can provide your body with 16 g of protein, 1 g of carbohydrates and 3 g of fat. Carnitas contain only two vitamins: vitamins A and C. In a 2-oz. serving, there are 100 IU of vitamin A and 1.8 mg of vitamin C. Carnitas also contain essential minerals such as calcium, iron, sodium and potassium. Each serving contains about 10 mg of calcium, approximately 1 mg of iron, 91 mg of sodium and 255 mg of potassium. Typical ingredients in carnitas are chicken broth, pork, cilantro, cumin, bay leaves, onion and chili sauce. 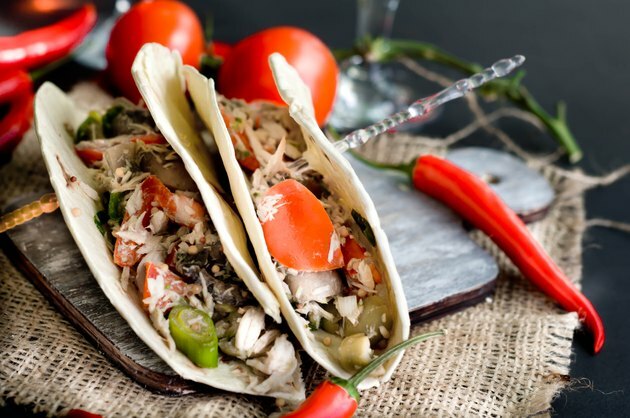 Other ingredient options include tortillas and salsa, which would constitute an a la carte order of carnitas, which is the most popular order. Due to the many different techniques and ingredients used to prepare carnitas, calories and macronutrients will vary depending on the preparer.